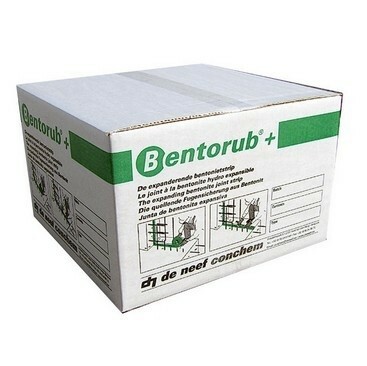 Bentorub is a green, flexible hydrophilic bentonite strip for the sealing of construction joints in concrete. It is made from natural bentonite clay and synthetic rubber. Bentorub is designed for sealing construction joints, cold joints and working joints in concrete, around pipe penetrations, in sewer joints, against slurry walls and sheet piling, etc. Profile size 25mm x 20mm. Roll size 5m. WRAS Approved. Bentorub has a proven track record in water treatment plants, water purification plants, underground parking lots, water reservoirs, swimming pools, water tanks, metro-works and other concrete structures subject to high water pressure up to 8 bar. The strip can be easily installed by nailing (4 to 5 nails per metre) or glued with Contact Adhesive, Swellseal Mastic or Bentoglue. It is recommended to protect the Bentorub strip using the Bentosteel fixing cage.